When I was young, there was a small grocery store up on the corner near our house called Lester’s. Being the youngest, I was always jealous of my older siblings when my mom would ask them to walk up to the corner and get a loaf of bread or a carton of milk for her. I was a toddler at the time, and it seemed like an adventure to get to walk all the way around the bend and up to the corner, by themselves, with my mom’s money, to get the things she needed. My brother, the closest to me in age, had started to get to do these trips by himself when he was about six years old, as it was a short distance and a safe neighborhood. I had made a note of this and was just looking forward to that day when I was old enough to go on such important errands. But then disaster struck. The grocery shop closed, and it became a limo rental facility. I was five years old, one year away from my long-awaited appointment, and I was heartbroken at the realization I would never get the adventure of running the important errand up to the store for milk or bread. To this day I have strong grocery store loyalty. I always assumed it probably had something to do with my unfulfilled dream of walks alone to Lester’s, but I’ve come to realize I’m not alone in this trait. For example, where do you buy milk? Eggs? 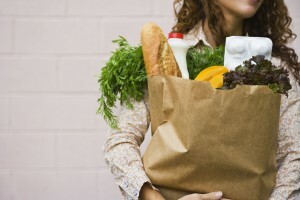 Where do you buy the fresh vegetables for your family dinners? Where do you buy your meat? As creatures of habit, whether it’s a large chain or a small corner store like Lester’s, we tend to have our places we always go for our particular grocery list items. The grocery store is one of the last places that connects us to that timeless American lifestyle. We all have to eat, and we all need a place to buy that food. That’s one of the reasons we love having a wholesale grocery store insurance product available for our insurance agents. We want you to be able to insure the places we love, and to protect one of the most essential and classic parts of our everyday lives. You can get grocery stores the protection they need so that they can keep serving us the way their industry has for generations. Have a quick question? Chat with us online now!